This unusual altitude dial in the form of a chalice, with an hour scale and a solar altitude scale inscribed on the inner surface, could be used for telling the time during the day. 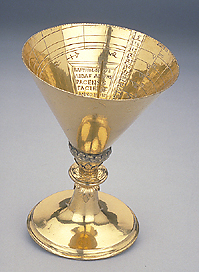 The chalice is rotated until the shadow of the pin gnomon projecting inwards lies in the correct month which can be identified by the zodiacal sign. The shadow of the tip of the gnomon then indicates true solar time in equal hours. The chalice can also be turned until the shadow of the tip of the gnomon falls on the solar altitude scale thus indicating the solar altitude. The instrument is laid out for latitude 48?, thus corresponding roughly to the latitude of Passau. It is the earliest extant chalice dial of ten so far recorded. Chalice dials appear briefly in southern Germany in the late 16th and early 17th centuries.